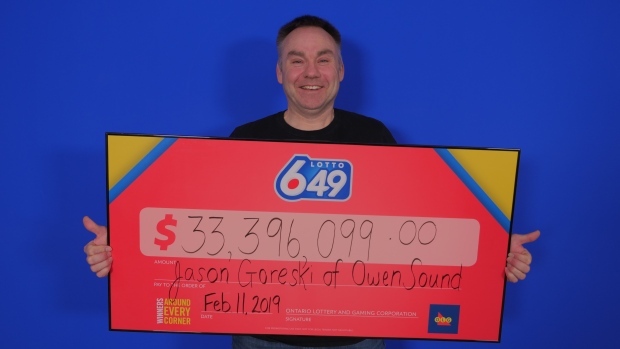 An Owen Sound man’s hope to someday own a cottage along the Bruce Peninsula has turned to more than just a possibility after recently winning big in the Lotto 6/49. Jason Goreski couldn’t believe his eyes when he checked his February 2 lottery ticket. With all six numbers a match, the 48-year-old father of two held the winning ticket worth $33,396,099. With no plans to retire just yet, the owner of an Owen Sound heating and cooling company says he’s going to buy that cottage he’s been dreaming about, along with a boat and a big dock. The winning ticket was purchased at a Circle K on 9th Street in Owen Sound.